Steve McNair – A Cautionary Tale? Married women all around are giving their husbands the side-eye upon news that football star Steve McNair may have been killed by his 20-year-old mistress. 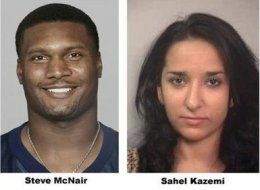 NASHVILLE, Tenn. (AP) – Police worked Sunday to unravel the relationship between slain former NFL quarterback Steve McNair and his friend, a 20-year-old woman who was found shot to death alongside him in his downtown condominium. McNair, who led the famous Tennessee Titans' drive that came a yard short of forcing overtime in the 2000 Super Bowl, was found dead on a sofa in the living room Saturday with multiple gunshot wounds, including one to the head. His friend, Sahel Kazemi, was very close to him on the floor, killed by a single gunshot. A pistol was discovered near her, but police said it took a while to find the firearm. I was on Twitter, when Holly Robinson Peete, who is married to ex-NFL er Rodney Peete, posed the question, @hollyrpeeteWill the Steve McNair tragedy scare married men straight like the '87 film"Fatal Attraction"did for a while? I retweeted, probably not. Mrs. Peete sent me a tweet stating that, @Talulazoeapple one can hope. After I got over the fact that Holly Robinson Peete had just tweeted me, lol, I started thinking. What is Mechelle McNair to do? She has four children with this man who was senselessly taken from her by his alleged jump-off girlfriend. Do stories like these make a married man think twice before "hiking the Appalachian Trail"? I don't know. If the fear of God, AIDS, or losing half your assets won't do it. I am not sure what will. It seem that all that goes doubly true for rich and famous men; they have the means and status to attract many more women than most. I feel for his wife and sons. I can only imagine she is feeling a mix of complex of emotion anger, grief, and sorrow. Steve McNair was known for his given heart and kindness and it is unfortunate one of the last news stories involving him is his murder by a jump off. It’s like the bible says, there is nothing done in the dark that won’t come to the light. It’s is just too sad for the children and wife. Men need to realize they can’t play these mind games with emotional really young women. They have nothing to lose in comparison to a married man with kids.